We treat everyone like family, customers and employees alike. Our goal has always been to support and encourage our technicians and staff to receive proper training and advance their careers through constant self-improvement. Being dedicated to our employees has resulted in a loyal staff, which we believe is unique in today’s world of business. A shining example of this loyalty is service manager Mark Fantone, who has been Wayne Roggi’s “right hand man” for more than 30 years. Having talented people like Mark stay with us for years of service has allowed Roggi’s to maintain the high quality standards our customers have come to expect. All of our certified professionals are required to continue their automotive education by attending training seminars for European, foreign and domestic vehicles and taking courses to help them maintain their credentials and stay abreast of evolving technologies. experts, or receiving a diagnostic evaluation at the shop, you will experience the value of teamwork and cooperation. Everyone at Roggi’s is on the same page when it comes to auto repair – and every customer is an A-List customer in our book. At Roggi’s Auto Service, teamwork is a way of life – And it’s the best way we have found to promote the highest quality standards in the industry. Only the best – From our family to yours. Paulette Dwyer is Office Manager at Roggi’s. She has experience in the healthcare, banking and municipal industries. Throughout her career, she has handled all aspects of office and business management. Paulette enjoys event planning and decoration. And she has 4 children that keep her very, very busy. She is also taking Business Administration classes at Manchester Community College. In her free time, she loves cruising around in her 2017 Nissan Altima Sport. 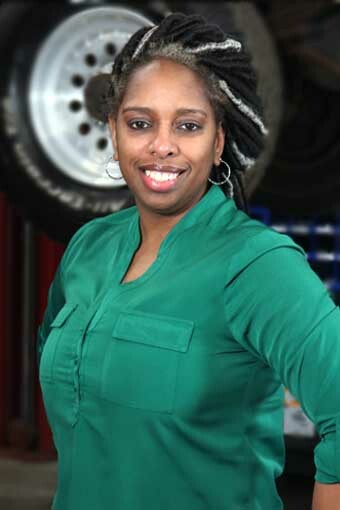 Paulette remembers watching her brother work on cars as they were growing up. He explained everything to her and she credits all her automotive knowledge to his teachings. 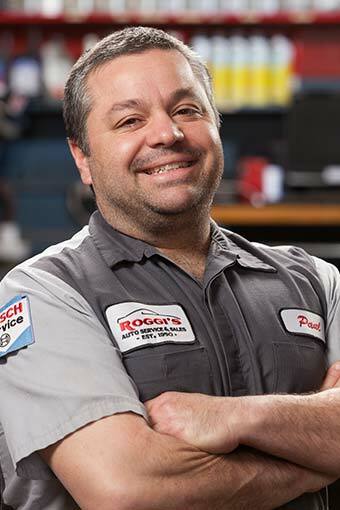 Mark Fontaine started with Roggi’s Auto Service in August 1978. He is the longest running employee (by far!) Because of his years of experience Mark takes on the specialty work, he is the problem solver “The Fixer”. Mark is a graduate of Prince Tech, class of 1976. He was top of the class and won the Snap-on Tool Box Award. Mark enjoys driving his 1968 Chevelle. It was the first car he bought at 15 years old and he still has it today. Sounds like Mark finds what he likes and sticks with it! John Vardal has been with this company since 2009. A loving husband and father of 3, John lives in Wethersfield, and enjoys boating and playing guitar while not at work. In his younger days, he also enjoyed drag racing. Growing up, he enjoyed working on cars; as he got older, he realized this was the only field that held his interest in quite this way. Today, he is certified by the National Institute for Automotive Service Excellence in the areas of electrical, engine performance, steering and suspension, air conditioning by the State of Connecticut for emissions repairs. When asked why he thinks he has been successful in this field, he says the following: “my instincts have served me well”. 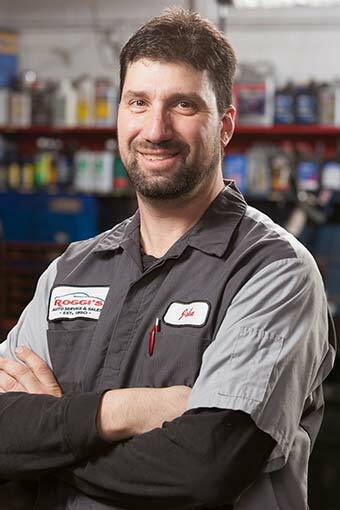 Adam Funkhouser started with Roggi’s Auto Service in 2006. While not at work, he enjoys spending time with his wife Elizabeth, children Shelby and Alexander, and two dogs, Yankee and Ziva. He recently returned to school to work on earning an engineering degree. When not working or studying, he enjoys playing disc golf. Always curious about how things work, Adam found that his interest included cars. While working on his own car, he found that he had a talent for this type of work. He holds a degree in auto technology from Porter and Chester and certifications from the National Institute for Automotive Service in brakes and engine performance. European cars and very technical engine repairs such as timing chains and cam adjustors have become his specialties during his time here. 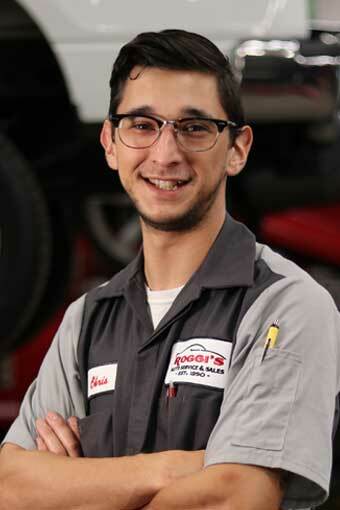 Some of his favorite things about working at Roggi’s include the family atmosphere where employees aren’t just employees, and opportunities to work on and drive cars he wouldn’t necessarily have the privilege to if he worked in another shop or in another field. Paul Misseri joined Roggi’s Garage in 1993, at 21 years of age. During his time, the Roggi’s family has had the privilege of watching him get married to his beautiful wife Agata and become a father to three wonderful children. Outside of work, Paul loves working on his 1972 Chevrolet Camaro, taking his kids to car shows, and riding ATVs with his family. 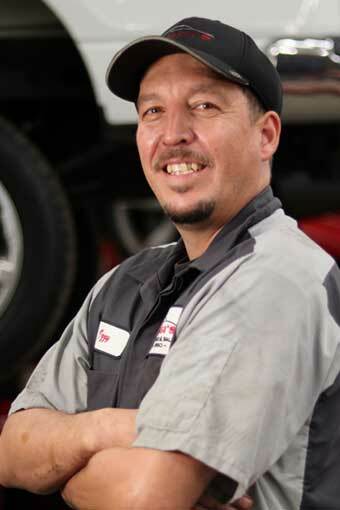 Paul is certified by the National institute of Automotive Service Excellence in brakes, suspension, and engine performance and by the State of Connecticut for emissions repairs. . His specialties include working on trucks, Hondas, and Nissans. Carlos began his auto repair training at Baron Institute of Technology (Now Lincoln Technical Institute) in East Windsor. He enrolled straight out of high school and graduated in 2007. 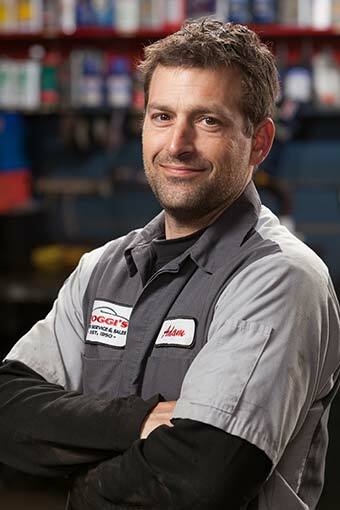 Before joining the Roggi’s family, he gained 9 years of automotive repair experience while working at Walmart and Goodyear. Carlos and his wife, Franchesca have three boys, Xavian, Brandon, and Lavaund. In his spare time, he coaches baseball and football and enjoys fishing. He’s great at repairing cars and trucks, but if you ask him about his favorite vehicle, he’ll tell you he’s a “motorcycle guy.” His favorite vehicles: a 2006 Yamaha R1 and a ’98 Kawasaki. Chris discovered his talent for working on vehicles while “messing around” with cars in his grandfather’s backyard. He’s since developed extensive automotive repair skills through hands-on experience and on-the-job training. His professionalism stood out during his first job at a gas station. 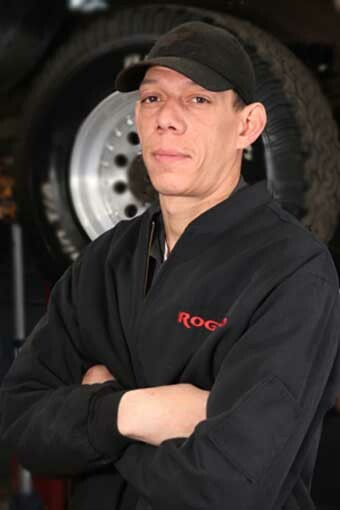 He’s since proven himself as a skilled automotive technician and a valuable member or the Roggi’s family. Chris is married to Jen and has a daughter named Meghan. His hands-on enthusiasm carries over into his personal life with his favorite hobbies: fishing and building Subaru race engines. Izzy became interested in automotive repair when he was young and he began ‘messing around’ with his own cars. He later attended Baron Institute of Technology and began working with a dealership after graduation. He’s been a professional repair technician for 18 years. 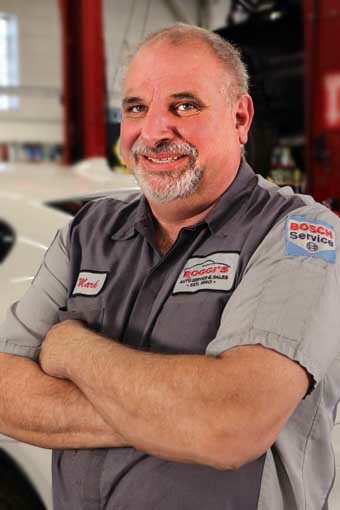 At Roggi’s, he diagnoses vehicle conditions and performs a variety of repair jobs. In his spare time, Izzy bowls on several leagues and enjoys spending time with his daughter, Janelys. Jobet has worked at Roggi’s for only a few months but he began his automotive repair career in Puerto Rico. There, he received his technician’s license after earning an associates degree. His courses covered combustion, computers, exhaust systems, front end, brakes, and other vehicle systems. 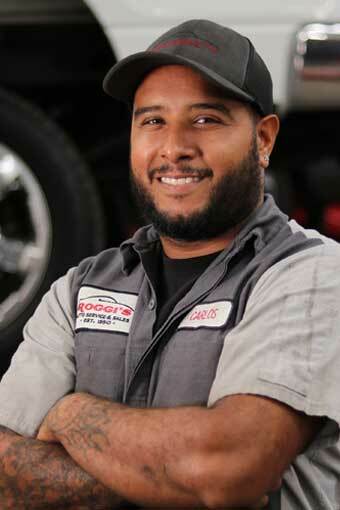 He uses his skills to perform a wide variety of car repairs at Roggi’s. Jobet came to the mainland over 12 years ago. His favorite car is a restored 1981 Mazda R7. He did all the restoration work himself and only drives it on Sundays during the summertime.